I just upgraded to Windows 10, previously I had Windows 7 with my NVIDIA drivers running perfectly fine. They were removed when I upgraded. However, whenever I try to install the Windows 10 drivers I am always met with this message. This is from 353.62 however it also occurred with 353.30. Try running the display driver uninstaller, which is now windows 10 compatible, and then reinstalling the latest stable Nvidia drivers. Windows 10 is an option in the Windows version drop down box under manual selection. It should be automatically detected in their scanning software. Running the display driver uninstaller solved the issue, thanks! Yeah, thanks darkbreeze! It worked for me as well. The GURU-3D method of removing bits left from previous drivers worked for me too. Many thanks. For anyone else who may see this, I didn't have to run the uninstaller. 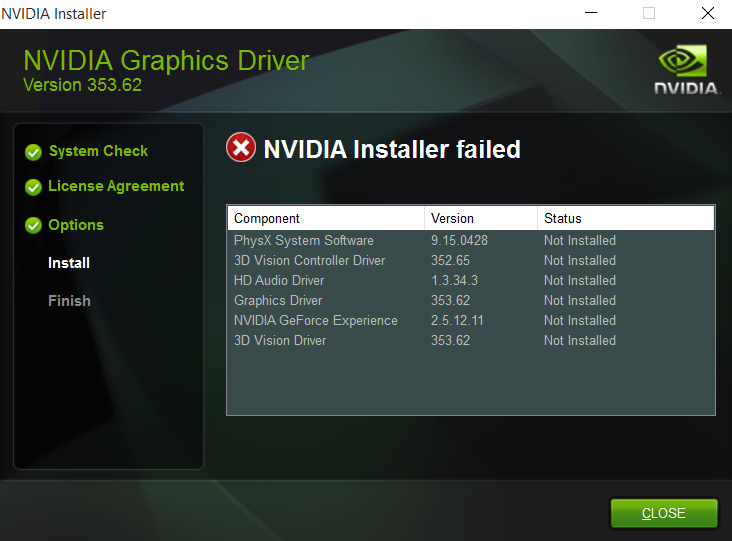 I just downloaded the latest installer from the NVIDIA website and my drivers worked fine after running it. Its just a good idea to run the DDU uninstaller. The normal upgrade process leaves too much stuff laying around when it does the uninstall of the previous drivers, and sooner or later, that stuff somehow seems to come back to haunt you. I had the same problem. DDU uninstaller did the trick for me. Running NVidia's latest installer didn't work until I had completed the uninstall. Windows Update tried to update the driver but couldn't. After running DDU NVidia installer worked perfectly. This worked for me. THANK YOU!!! THANK YOU!!! THANK YOU!!! Like others have noted, I did a clean install of Win 10 (not an upgrade) and the driver would not install. Running DDU Uninstaller and disabling auto install of the MS provided NVIDIA driver allowed me to install the Win 10 driver from NVIDIA before things got broken. That worked. I downloaded it using the new Edge browser in Win 10 without a problem. Its not google that is blocking it. I download it all the time. In fact, in testing, I grabbed it again yesterday. No problem at all. I have no issues with the download either. Check that something in your settings isn't blocking it. This is not working for me.. I tried uninstalling it with guru, then installing the driver manually, but i still got error code 43 for my GPU, and it didn't work. Nvidia Driver got Uninstalled, Windows 10 updated itself. Reinstalled OS. Now black screen or very slow at best.